A home renovation is challenging to say the least, but this isn’t to say that it can’t be enjoyable! Your project needn’t be daunting or stressful, not when Skips Preston is always on hand to help. The team at Skips Preston take care of the disposal of any materials that you no longer want or need, allowing you to concentrate your efforts on completing your project sooner. Specialising in skip hire Preston, we offer an array of cost-effective disposal services to customers based in the North West, including Bolton, Chorley, Wigan and Leyland. Don’t feel like you have to rush your renovation project. If work is to be completed to the highest quality standard, you need to take the time to plan every step of your project. Generally, skip hire Bolton is ideal for removing waste from your home renovation project, but not all companies offer flexible skip hire services. Here at Skips Preston, we provide skip hire Bolton to suit all projects, ensuring that you find a suitable solution for storing waste that your renovation project generates. If you expect your project to generate a substantial amount of waste, you may wish to extend the hire period for your skip, and for us, this is not a problem! Simply discuss your needs in detail with us by calling 01772827603 and we will do our best to accommodate your requirements. When looking for a reputable supplier of skip hire Preston, don’t just choose the first company that you find; likewise, don’t just take our word for it! For your renovation project, you need to find a company that offers flexibility towards your project requirements, providing skips in all shapes and sizes which are compatible with all types of waste. Ask friends, family and neighbours for recommendations when searching for skip hire Chorley (or any area for that matter). Feedback can determine whether the company is right for you and can help you to discover the best deal for your skip hire Chorley. Here at Skips Preston, we remove the hassle of disposing of waste, making it easier for you to maintain a neat and tidy environment. Why not request a FREE quote today? Like any of the services that we provide for the domestic sector, skip hire Leyland is priced competitively to ensure that you receive the best value for your money. The cost varies slightly depending on the size of the skip, the duration of your project and where you choose to leave it. Skips that are left on the road overnight will require a permit, which is included in the markup cost of your skip hire. No matter which skip you choose to hire from Skips Preston, we offer a solution for every budget, accounting for the most diverse demands too. Your home renovation project is bound to generate waste from various streams. Instead of leaving this to pile up on your driveway to cause a trip hazard, we recommend investing in skip hire Leyland today. The domestic skips that we supply are perfect for storing all kinds of materials, including furniture, appliances, mattresses and carpets. If you’re ever unsure what can be thrown inside the skips that we supply, feel free to check with our team of professionals to clarify your intended use of the skip. Tips for completing your renovation. You want to improve your property for the better, and rightly so. 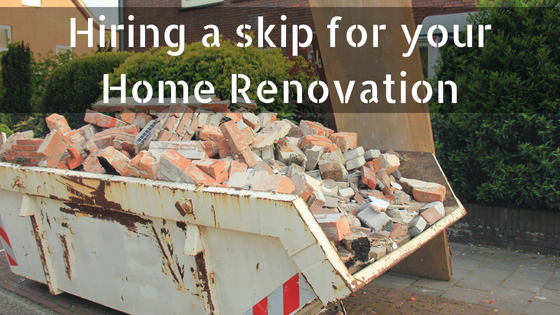 Here at Skips Preston, we understand the importance of taking your time when renovating your home, hence why we deliver and collect skips at a time that is most convenient for you. To keep the cost of your skip hire Wigan to a minimum, try to hire your equipment on flexible terms so that you can return them once your project is completed. In addition to this, plan your project in plenty of time, covering every aspect before undertaking any work. Not only will this allow you to update your property to suit your exact needs but will also eliminate the likelihood of tasks being left incomplete. Make sure that you choose the right sized skip for your skip hire Wigan. In doing so, you’ll be able to save money and fit all of your waste inside reliably, without breaching skip hire regulations and being handed an expensive fine. Most importantly- don’t stress! Renovations are supposed to be fun and enjoyable, not stressful and time-consuming! Need to know more about how we can help with your home renovation? Get in touch with us today.